Thalys International, which provides high speed rail service between Brussels, Amsterdam, Cologne and Paris, now has a mobile site, thalys.mobi. The mobile edition offers schedule and fare lookups and contact numbers. The two main functions, Schedules and Fares are very similar and use a “wizard” interface. On the first screen you choose your start point from a drop down and click Next. A second screen prompts for destination station and for travel date and time which both default to current. Results are on a third screen. The wizard interface is intuitive and works well for this sort of data entry. Unfortunately. Thalys.mobi has a couple of completely unnecessary and annoying usability issues. To find the price of your trip you have to select the start and end stations all over again. There really should be a link to the prices right on the schedule result page. On of my pet peeves is also found of Thalys.mobi. All the phone numbers on the “Buying” page are just text rather than click to call links! Are they deliberately trying to make it hard to call their reservation numbers? I am pleased that Thalys is promoting their mobile site with a banner ad on the front page of the Thalys.com PC site. So many major web sites now have mobile editions but don’t promote or link to them forcing users to search. 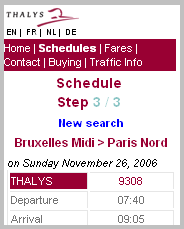 Thalys.mobi is on the Travel-Transit/Rail page at Yeswap.com. This entry was posted in Site Reviews, Travel by Dennis Bournique. Bookmark the permalink.